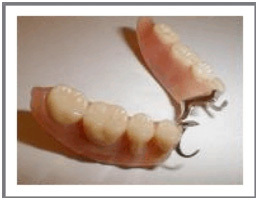 Partial dentures replace missing teeth and restore your smile. It allows one to chew more easily and with greater comfort. The partial will also help keep your remaining teeth from “drifting.” Wearing a partial can be easy, just spend a little time getting used to it. If you take good care of your partial, your mouth will be healthier and help your partial last. A partial denture is made up of one or more porcelain or plastic replacement teeth. Gum colored plastic attaches these teeth to a metal framework. The partial is removable and is held in your mouth with metal clasps. Several visits to the dentist may be needed to be sure the partial fits properly. Your partial is custom-made for your mouth. Even so, it may feel awkward for the first few weeks while your mouth gets used to it. See your dentist if your partial is loose, causes soreness, or is bent or broken never make any adjustments yourself. Take good care of your partial. It will keep you chewing well and looking great for many years.